Throw legos down on the floor of a nursery and two types of children will emerge: thinkers and doers. 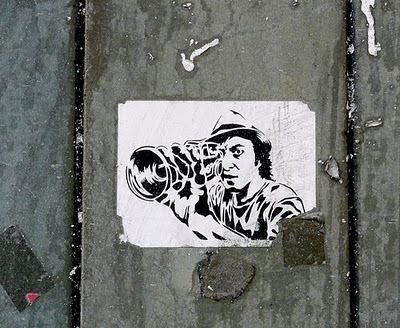 The thinkers pose with purpose – piecing mental masterpieces and creating the vision with precision. Thinkers care about how others perceive their work, since internally the work is the outpouring of the worker, a hint of self, desiring to be known. It plays upon the eternal to leave such a mark – a grasp on immortality, some might say. For the doer, however, the project is one of accomplishment. Block towers are built to be torn down. The rubble is equal joy to the construct itself. 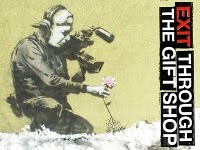 It is in the doing and the done.In this documentary film entitled Exit Through the Gift Shop, artist Banksy shares much of the life of accidental artist Thierry Guetta. 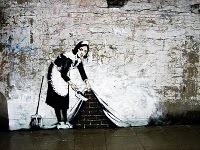 Banksy is a self-proclaimed, self-promoted, yet ironically self-effacing graffiti artist. He shouts art for art’s sake. I have always appreciated, in some rebellious way, well-placed graffiti. And, though unfamiliar with his name until tonight, I recognized Banksy’s work immediately. Maybe that’s his true point: promoting ideals, not effort, propaganda through paint. 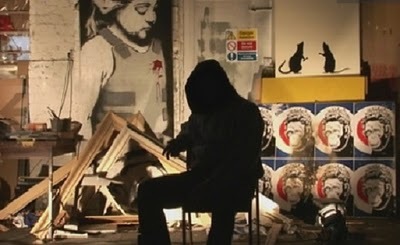 His bitterness felt acutely, Banksy used mostly old footage from Guetta’s possessed “filmmaker” days before Guetta himself used what he learned, became a copycat street artist, and took the nom de plume: Mister Brainwash. Unbeknownst to world-renowned street artists such as Banksy and Shepard Fairey, they were training Guetta as master teachers would an apprentice. As far as documentary films go, this entertains as though a Christopher Guest creation. The artist reveals his own absurdity without analytical reinterpretation. Where Banksy delights in educating the world through careful placement and purpose, so Guetta proves only to paint the tower just in time to see it crumble to the ground. And afterward, I felt a possessive impulse to go and tag a building myself, but it was getting a little late.